For those that haven’t played it before, I’ll give a quick overview of the “standard” version of the game and then go into the new things that Dreamscape adds to the mix. 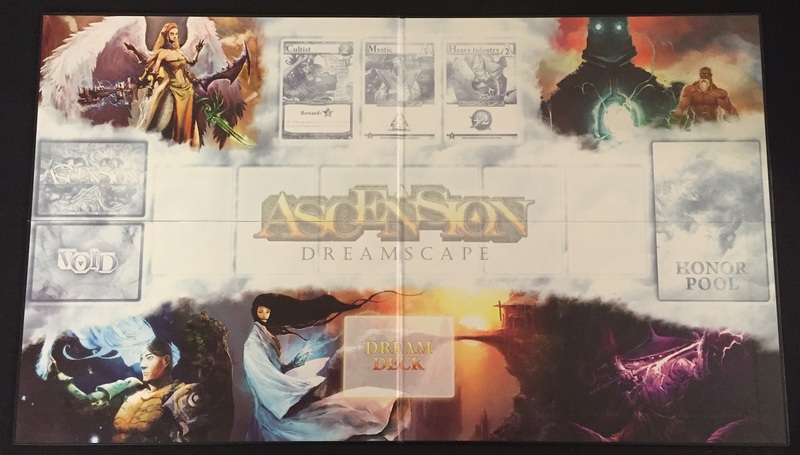 Ascension is a deckbuilding card game. The goal is to have the most honor points at the end of the game. Players start with a 10-card basic starting deck and will slowly add to and augment that deck as play progresses on. Setting up is rather simple. 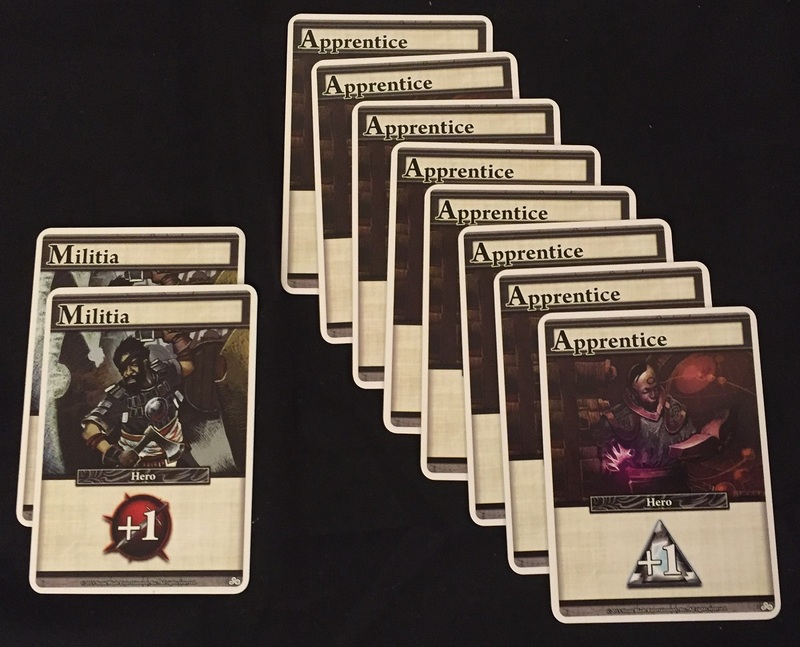 Each player starts out with a deck of 10 cards that consists of 8 Apprentice cards and 2 Militia cards. The game board is set into the middle where people can reach it. In the middle of the board is the Fate deck. This gets shuffled and the top 6 cards drawn off of it and placed on the board. Depending on how many players there are, a certain number of Honor tokens are also placed in their spot on the board (the math to figure out how many Honor tokens is used is easy. It’s 30 per player. So 60 for a 2-player game, 90 for a 3-player, and so on). The stacks of Heavy Infantry and Mystics are also placed on the board. Players shuffle their starting deck and draw a hand of 5 cards, and the first player is ready to take their turn. 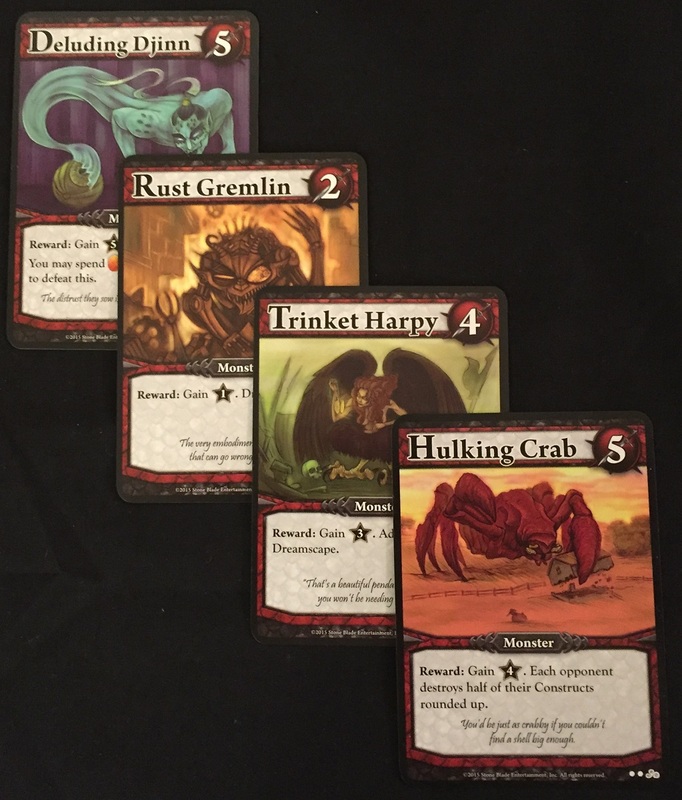 On their turn, players play cards from their hand in order to purchase Heroes and Constructs from the cards in the middle, or to defeat monsters. When a card is purchased, it goes into that player’s discard pile and a new card is flipped from the Fate Deck. When a monster is defeated, it goes into the Void, which is a discard pile next to the Fate Deck. Defeating monsters (and certain other cards) let players gain Honor from the Honor pool. At the end of a player’s turn, they place all the cards they played that turn into their discard pile and they draw up 5 more cards. If they don’t have enough cards to draw up to a full 5, they shuffle their discard pile and make a new draw pile out of it, then draw up to their 5 cards. This way, the cards you purchased are cycled around and up into your hand. The Honor Pool is also a sort of “timer” on the game. When the last Honor Point is taken from the pool, it signifies the end round of the game. You can still gain Honor Points, you just have to keep track somehow beyond the little tokens. Thinking back to who took the first turn, everyone gets a turn until that player would go again. So if that first player already had their turn this round, they won’t get another. But if it is their turn, then they finish their turn and then everyone else gets a turn. That way, nobody is left having fewer turns than someone else. After everyone has had their final turn, players count up the amount of Honor Points they have. Plus, cards that have been purchased from the center of the board also have an Honor Point total in a little star down in the bottom corner of the card. The player with the highest total is the winner. So what is it that sets the Dreamscape expansion apart from the others? That would be the Insight (a new resource in the game) and the Dream Cards. You use one to purchase the other. Lemme explain. At the start of the game, as part of the initial set up, you shuffle the Dream Cards into their own Dream deck. 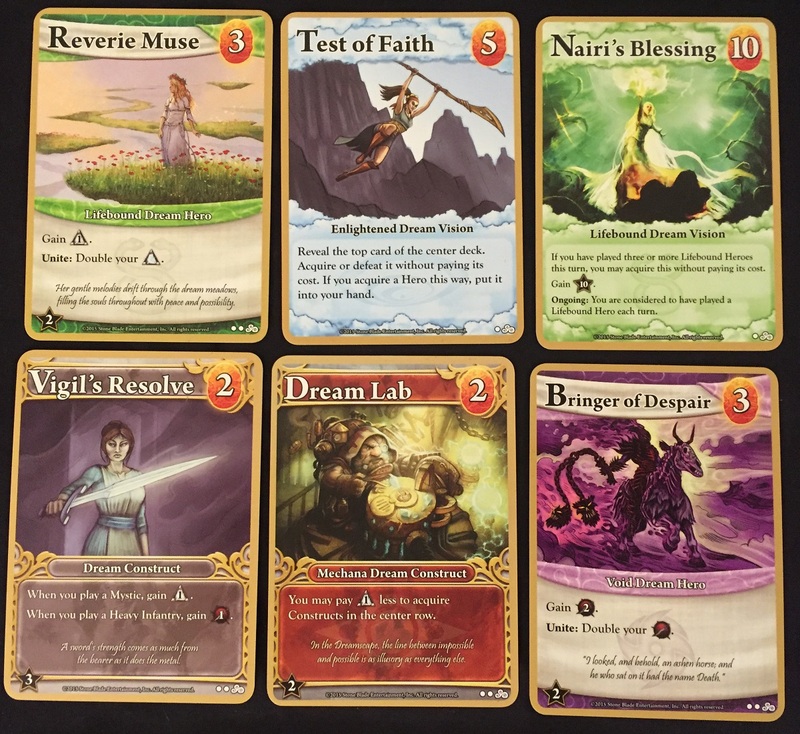 The Dream Cards can be told apart from regular Fate Deck cards by the golden border around the front of the card and that their cost in the upper right is in Insight, as opposed to Runes or Power. After shuffling, deal each player 5 Dream Cards. Of those 5, each player picks 3 and places them, face-down in front of them. The leftover cards are shuffled back into the Dream Deck, which is placed where everyone can reach it. Dream Cards are new Heroes, Constructs, and Visions. The Heroes and Constructs work just as the standard versions do. The Visions are a new form of card. For those that have played Magic: The Gathering, they could be thought of as either Instants or, if they have an Ongoing ability, an Effect. 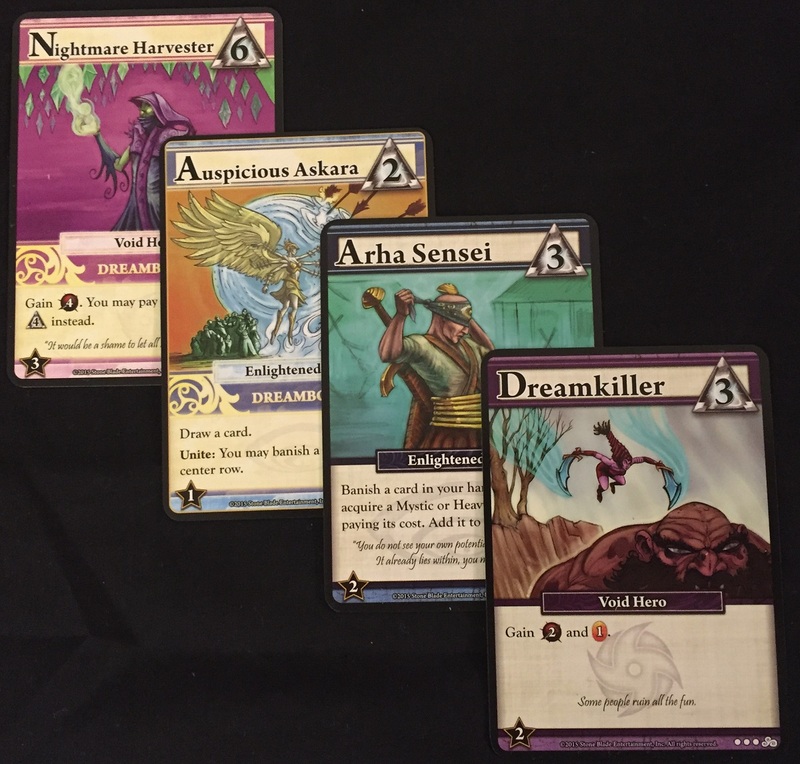 Visions might let you defeat a monster in the center row without paying any cost, or Destroy an enemy Constructs, or Banish all cards in the Center Row. The way you buy the Dream Cards is by using Insight. This is a new resource in the game, like Runes and Power. However, unlike those other resources, that are lost if left unused at the end of your turn, Insight will stay with you until you use it. 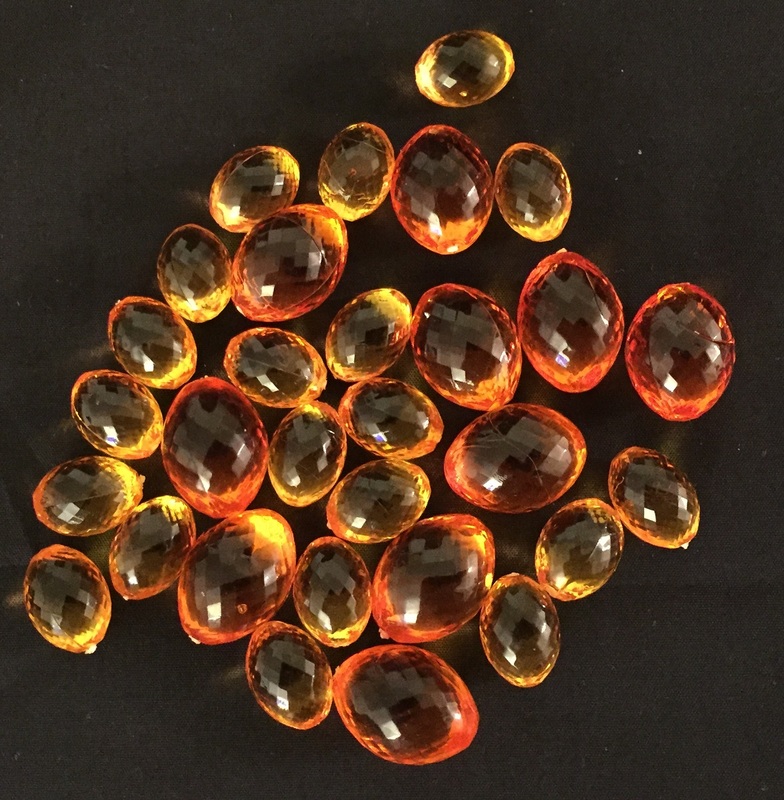 As such, the game comes with special tokens that you can use to keep track of how much Insight you’ve gained. There are a couple ways Insight can be gained. Certain cards in the Fate Deck are listed as “Dreamborn” on them. When one of these enters the Center Row, every player gains 1 Insight. Then, when that card is purchased, the player who buys it gains another 1 Insight. Other cards in the Fate Deck will also give Insight when played. When you want to purchase one of the Dream Cards in front of you, you spend the appropriate amount of Insight and, if it’s a Hero or Construct, place it in your discard pile as usual. If it’s a Vision, its effect is used right away and it is Banished, unless it is Ongoing, in which case it is placed in front of you. These Dream cards can be acquired only by the player who they are in front of. This is different from cards in the Fate deck, which anyone can purchase on their turn. They are also always kept face-down until acquired (though you can look at your own Dream Cards, but not your opponent’s). You can only acquire them on your turn. So no blowing up someone else’s constructs or clearing the Center Row during someone else’s turn. 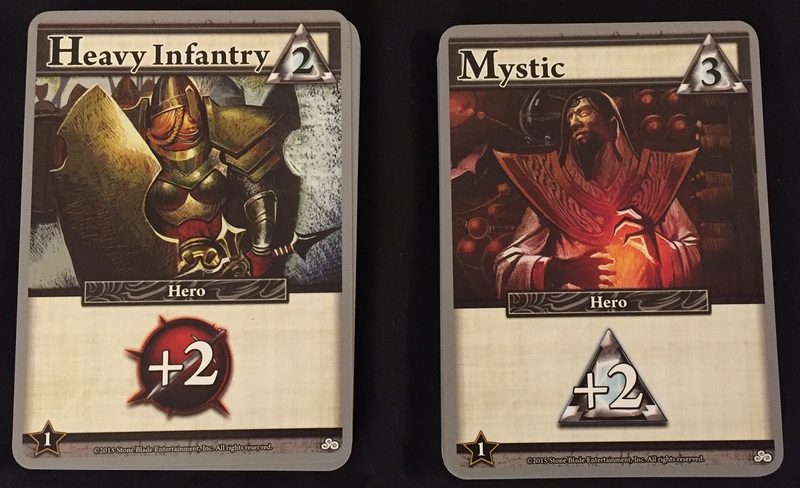 Other than that, they function like regular cards for your deck, with an Honor Point total in their bottom corner. Just 5 More Minutes, Ma! This is not the first Ascension set to introduce a new resource to the game. Two previous sets used Energy as a resource. However, it was used as a threshold. So if you gained 4 Energy during a turn, you got to benefit from everything that required you to have 1-4 Energy. Another expansion had a side-deck of cards that you could potentially draw from, called Soul Gems. 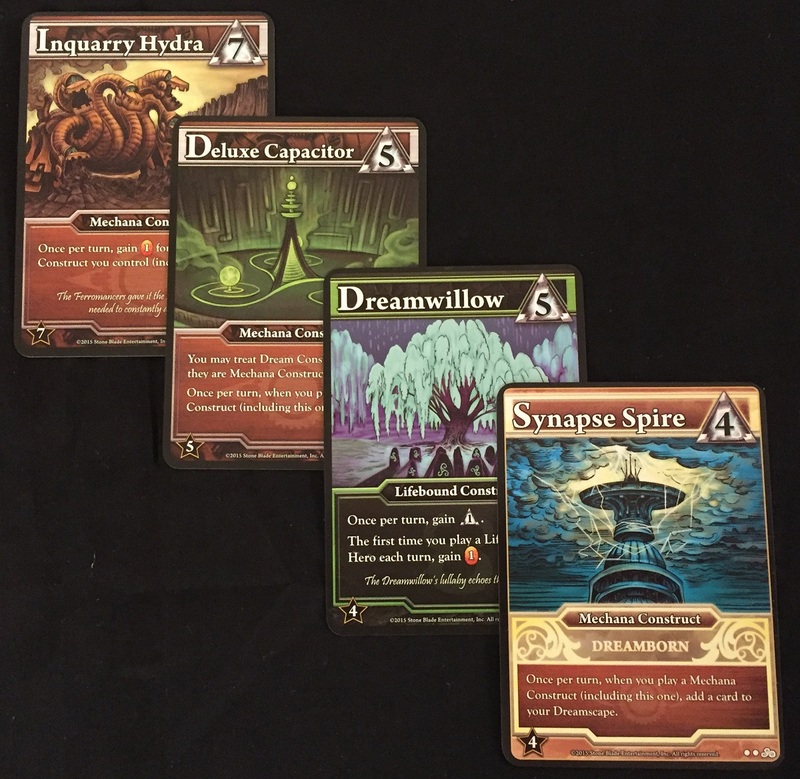 But with how you have hidden cards available only to use, and with how Insight stays around from turn to turn until you spend it, the Dreamscape set really sets itself apart from the others. None of the new mechanics feel “recycled” in any way. 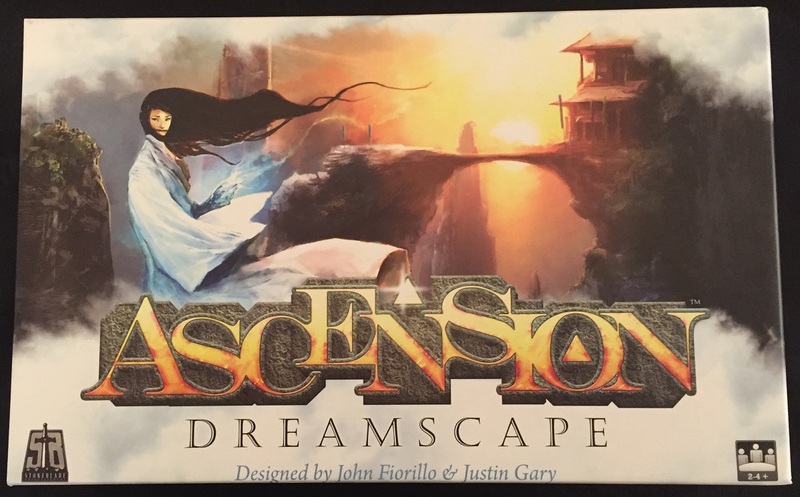 Also, they are not so complex that if Dreamscape was your first-ever Ascension set, you’d be confused about how things work. I feel that’s one of the real strengths of the different Ascension sets. While each one adds onto the “basic” game, none of them are confusing or redundant. 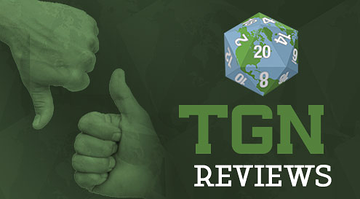 It’s easy to tell that the game designers have a background with Magic: The Gathering (with how those expansions will have a sort of “set theme rule” that they bring to the table). 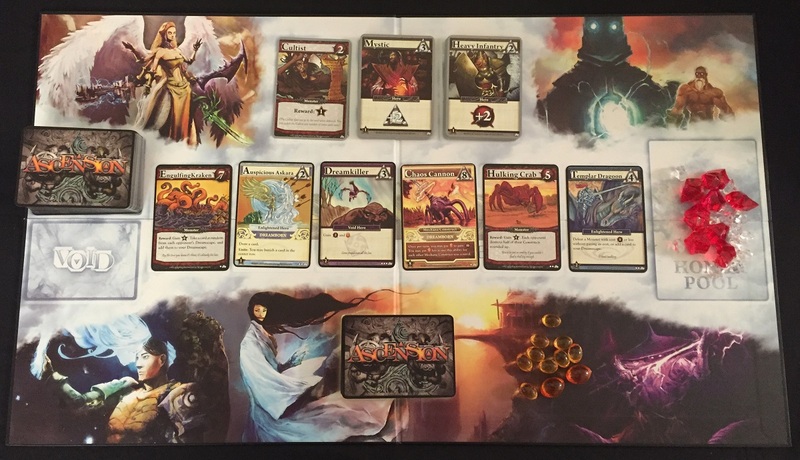 I feel that Ascension: Dreamscape is a great addition to the Ascension game family. I’m happy to be adding it to my collection and look forward for a chance to play it this holiday season. 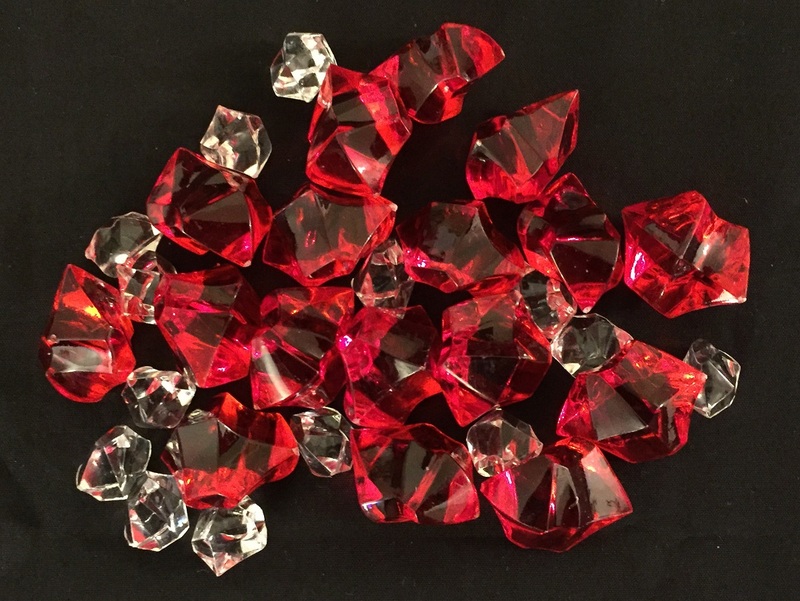 The game was just released yesterday and is available to order in the Stone Blade webshop.